AKVIS Points lets you transform your photos into paintings using the pointillist painting technique. Pointillism is a painting technique is characterized by brush strokes applied as dots or spots. This style is an offshoot of Impressionism. A complex tone is decomposed into individual colors, shown in dotted lines as canvas, paint touches of pure colors. The optical mixture of these points gives the visual perception of an entire painting. This is exactly what happens on a computer screen that reproduces an image: the pixels are as dots in pointillist paintings. The software provides a number of presets ready to use. You can save your favorite settings as presets and use them in the future. The program offers the choice between a flat background and a rough surface that makes the result even more surprising and amazing. You can add a signature painting, an inscription, logo or watermark to protect copyright. 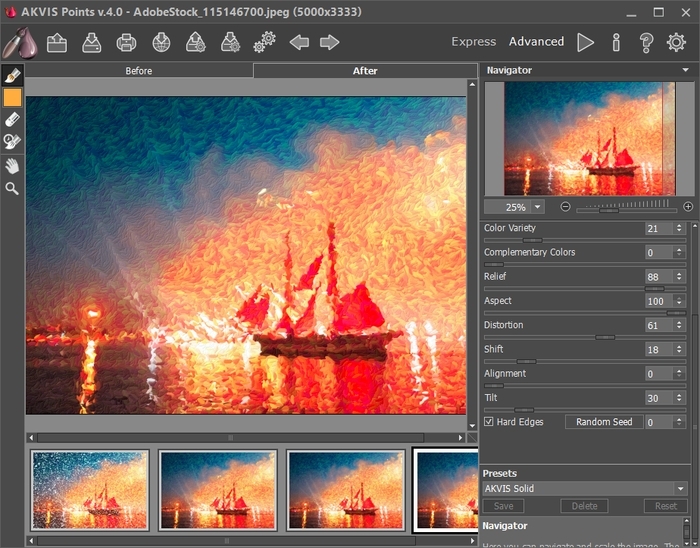 The software supports batch processing to automatically convert a series of images in paintings with the same effect settings. This feature is very useful when to create a lot of illustrations in the same style for a blog or a brochure or to create comics or cartoons with the technique of pointillism. Next story DMG Canvas 2.4.1 – Create custom disk images. Previous story Midnight 1.2.2 – Dark Theme Sketch Plugin. Vectoraster 7.0.0 – Creating vector-based raster patterns from bitmap images.